Do you want to install a VPN on your Raspberry Pi, HTPC, WeTek box, Fiveninja’s Slice, Odroid, or Cubox? 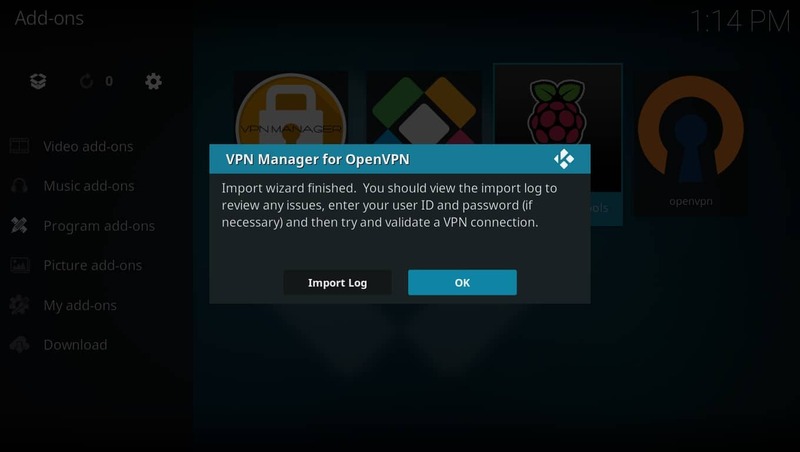 In this guide we’ll be showing you how to install a VPN on LibreELEC devices so you can browse securely and privately. We’ll also be looking at the best VPN for LibreELEC and explaining how to configure and test your installation. Kodi is a software package that allows you to quickly and easily set up your own home theater system. It’s highly versatile, capable of being installed on almost any popular device including PC (Windows, Mac, and Linux), Android, iPhone, Amazon Fire TV or Firestick, Raspberry Pi, Roku, Apple TV, Nvidia Shield, or USB flash drive. Better still, there’s almost no functional disparity between devices so if something works on PC, it’ll work on most mobile platforms too. Kodi is very simple to install, but there are a few extra steps required in order to use it safely. In this article, we’ll be leading you through the process of installing a VPN on LibreELEC systems so that you can keep your activities private and your data secure. While Kodi is completely legal to use, it has seen its reputation tarnished by third-party addons that provide unrestricted access to licensed content. Copyright legislation varies from one location to another so to minimize the risk of any legal issues, we strongly recommend our readers to research their country’s laws on streaming content online before attempting to use Kodi for this purpose. One of the best things about Kodi is that it can be installed on devices with very limited system resources. However, this usually requires some kind of operating system as well. 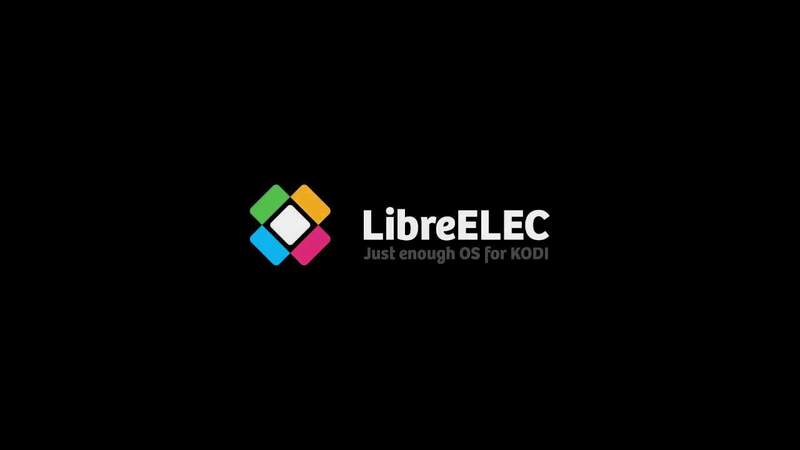 LibreELEC cuts out the middleman by installing only what is needed to run Kodi. 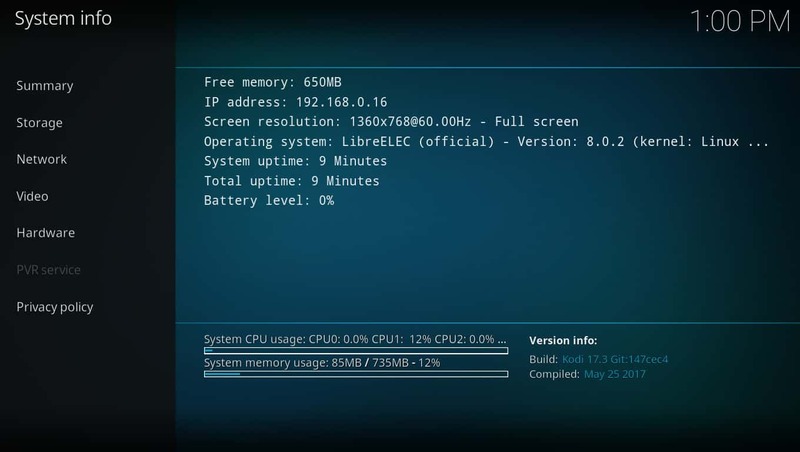 LibreELEC is slightly more complicated to properly setup and configure than other Kodi platforms due to its lack of a non-Kodi GUI file explorer. That said, once you know how to execute basic Linux commands, installing additional software like VPNs and repositories becomes very simple. Virtual private networks (VPNs) are often used to hide online browsing habits from a user’s internet service provider (ISP). Despite this, there are many ways a Kodi user can benefit from a VPN even if they only use official sources. VPNs increase your system’s security by encrypting your network traffic. This prevents any third-parties from seeing what you’re doing, rendering most Man-in-the-Middle attacks useless. It also stops your ISP from selling your traffic history or throttling your internet connection based on your streaming habits. While all VPNs will slow your network down to some degree, some have more of an impact than others. Streaming video requires a fast, consistent connection, so it’s important to choose a VPN that has minimal effect on your speeds. Also, some VPN providers keep logs of your activities, ultimately leaving you no more protected than someone who isn’t using a VPN. We recommend using IPVanish. It provides reliable, speedy connections to servers in more than 50 countries and does not keep any logs of your internet traffic. It’s also the easiest VPN to install on multiple platforms thanks to its dedicated Android, iOS, and Amazon Firestick apps. Because LibreELEC is a minimalistic Linux distribution, you can’t just install VPN software directly. Instead, we’ll be using a Kodi addon named VPN Manager for OpenVPN. This addon is available from the Zomboided repo, so the first step is getting this repo onto the LibreELEC system. We’ll be using IPVanish throughout, but the process is the same for most other well-known VPN providers. You might be thinking that installing the repo would be as easy as typing its address into Kodi’s file manager, but unfortunately that won’t work in this case. Instead, we have to connect via another computer using the secure shell (SSH) protocol. This sounds much more complicated than it actually is, so don’t worry. First, download PuTTY here. This is a Secure Shell (SSH) client that makes it very simple to connect to other devices on a network. We’ll be using it to transfer files to the LibreELEC device. Install PuTTY, open it, and make sure Connection type is set to SSH. On your LibreELEC device, go into the settings menu by clicking on the gear icon on the home screen. Next, click on System Settings. Click on the Add-ons tab on the left, then Unknown Sources. The button to the right should turn white to confirm that this setting is enabled. Next, return to the Settings menu. This time, choose the System information tab.You’ll see the IP address that your device is using. Enter this address into the Host Name field in PuTTY, then click the Open button at the bottom of the screen. A terminal will appear and you’ll be asked to log in. By default, LibreELEC’s SSH login username is “root” and its password is “libreelec,” so use these to connect unless you’ve previously changed them to something else. Linux does not show asterisks as you type your password, but rest assured, it is being entered. On your LibreELEC device, click the Add-ons tab on the home screen, then click the box icon in the top-left. Select Install from zip file, then Home Folder, and finally, master.zip. The VPN Manager for OpenVPN addon should install and you’ll see a notification appear in the top-right if everything goes well. Before we can start using a VPN, it first has to be configured. Right-click on the VPN Manager for OpenVPN icon and select Settings. From here, select your VPN provider and enter your login details. Kodi will push you back to the Add-on Browser page while it gathers the server information for your VPN, but should return you to the settings page afterwards. Next, click the VPN Connections tab on the left-hand side of the screen. You can now choose up to ten VPN servers to switch between. These servers can be changed at any time, so don’t feel like you have to spend a long time deciding on the best ones. Once you’ve chosen your servers, all that remains is to test the connection. If your VPN provider isn’t in the VPN Manager’s list, you can import it manually instead. To do this, you’ll have to download specific files from your VPN provider that allow you to connect to it. We’ll need the .crt file and at least one server file with the .ovpn filetype. You can usually find these files linked to in your VPN provider’s Linux installation guides. From the Kodi main menu, click the gear icon in the top-left. Next, select the File Manager option and click Add source. In the box that appears, add the location of your VPN’s configuration files and give the source a name. In our example, we’ve used the location of IPVanish’s files, but this will differ from provider to provider. 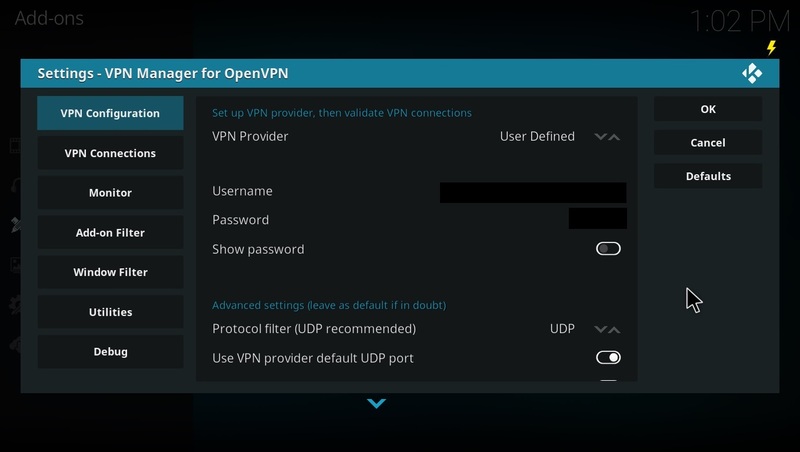 On your LibreELEC device, open the VPN Manager for OpenVPN’s settings page. Under VPN Provider select User Defined. Scroll down and click User Defined import wizard. Next we have to tell the VPN Manager where to find these files. By default, they should have been downloaded to the Home folder, so navigate there and upload both of them. You’ll be asked whether you’d like to update the server files – this tries to automatically fix any broken links and can save you from manually editing them, so we recommend it. Afterwards, go to the VPN Connections tab and add your servers in order of preference. Usually, testing a VPN connection is as simple as entering your IP address into an IP tracking website. However, because LibreELEC doesn’t have a web browser, we have to test the VPN another way. First, make sure your first VPN connection is an American server and your second is a British server. Next, go back to the Add-on Browser page. This time click the Install from repository option and choose the Kodi Add-on repository. Scroll through the list until you find the iPlayer WWW addon, then install it. Because the BBC region locks their content, the iPlayer cannot usually be watched from outside of the UK. 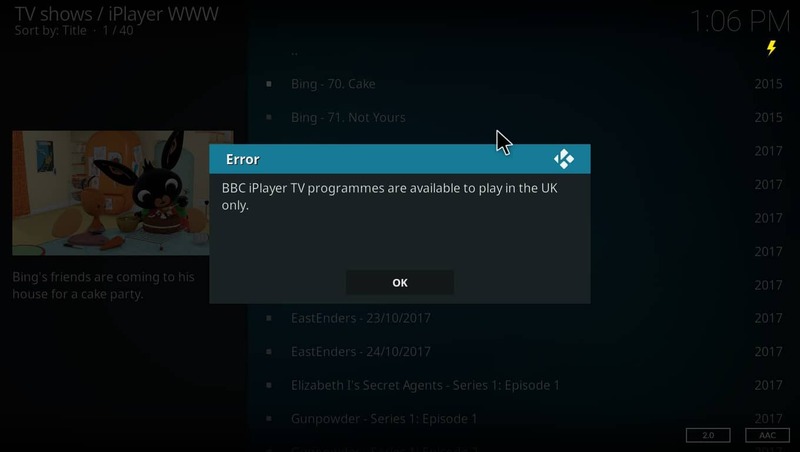 By connecting to an American VPN server, the iPlayer believes that we are located in the US. Assuming the VPN is working properly, the iPlayer should prevent you from seeing any of its content. Finally, connect to the British server and launch the iPlayer addon again. If everything is working as intended, this time you should be able to access the iPlayer’s content with no problems. Although installing a VPN on LibreELEC can seem daunting at first, it’s actually fairly straightforward. The techniques used to do this can also be used to install additional repositories in the future. Best of all, because your VPN is installed and working properly you’ll now be able to use Kodi safely and privately wherever you are.